The Stage 1 Non Heated Semi Downdraft offers a pressurised spray booth in modular platform that can be upgraded over time with additional features. This Australian made spray painting booths is an economical base price that offers excellent build quality and features corner lighting to ensure a bright working area with over 1000 lux of usable light. Fully compliant to Australian standards with performance, safety and quality as its core its hard to go past this Stage 1 unit for value. Standard with a “heating ready” design for when you wish to upgrade to heating in the future, this booth is a ideal baseline for spray painting in a clean environment. Common Industry Uses: Automotive repairs ( Custom cars and low volume panel shops), Kitchen Cabinet Making, High Gloss Finishes, Glass Splash back spray painting. Direct drive supply and exhaust fans provide optimal airflow performance. This combined with simple and easy to read controls ensure a reliable high performance package. We’ve got your back. We are so confident in how we build our products that we offer you a 5 year warranty. Including full Service maintenance backup. 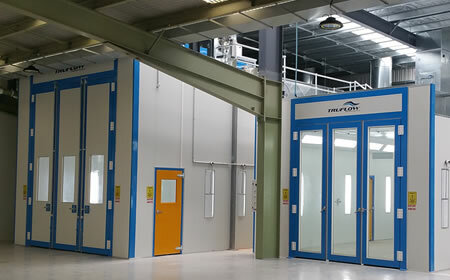 Robust structure so it lasts a lifetime with a sleek design that will lift the appearance of any workshop. The Stage 2 Heated Elite Semi Downdraft is the ultimate spraying and baking Australian made painting booth with semi downdraft format airflow. The combination booth offers spray temperature of 25.C and baking mode capable of 70.C. The heating feature will ensure high production capability, quality control and full compliance with Australian standards. 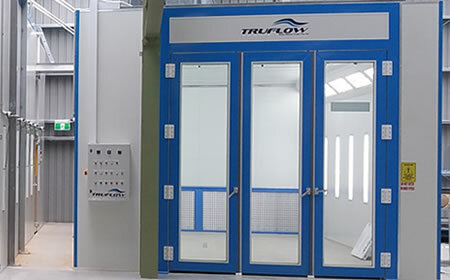 Manufactured in Australia by TRUFLOW this system ensures rapid curing of paint, flexibility to paint various product types, safety and performance. Standard with EPS core 50mm insulated cabin panels, a Direct Fire GAS heater and engineered roof structure with Corner lighting for optimal efficiency you cant go past the stage 2 as great value for money full feature spray booth. Common Industry Uses: Automotive repairs ( Custom Cars and Bodyshop repairers), Kitchen Cabinet Making, High Gloss Finishes, Glass Splash back spray painting. With fully adjustable heating it is possible to control your environment during spray cycle to a optimum 25.C or to bake over a timed period at 70.C. This feature both improves paint adhesion and cycle times. Direct Fired gas is also at minimum 50% more effective when compared to in-direct heating systems. The semi downdraught has a flexible design platform and the unit can be adjusted to suit different size’s, factory shapes and door openings. This flexibility makes the semi downdraught an ideal choice for Automotive, cabinet making, parts spraying as well as industrial applications. 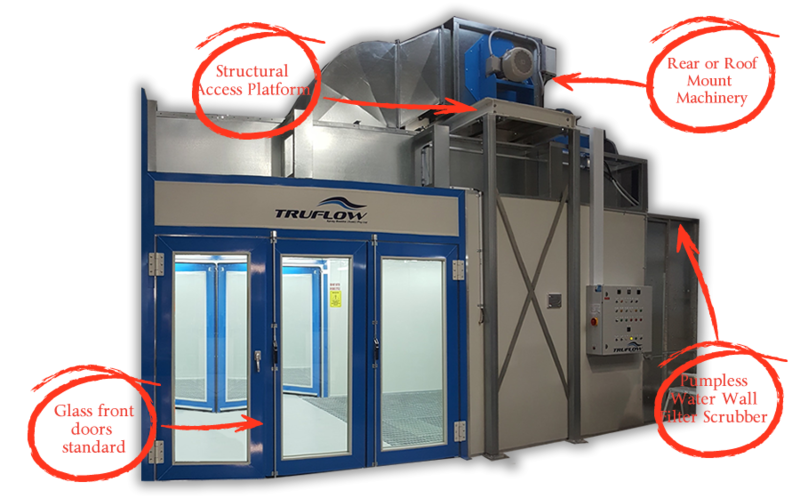 Machinery can be positioned either on the roof of the spray booth which includes an engineered access platform or via a read mounted machine box that combines both inlet/ exhaust and heating into one stand alone unit at the rear of the booth. The semi downdraught is a pressurised booth. 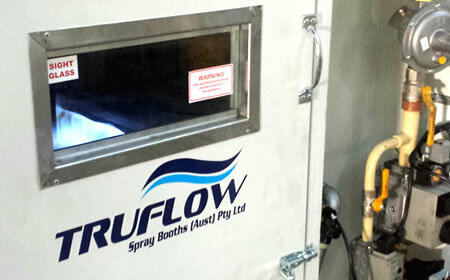 The advantage of pressurised booths are in the filtration methods which allow for 560G-10 level filtration cleaning air up to 10um ( 10 microns) prior to entry into the spray area. This means the air is filtered with particles as small as pollen removed from entering the cabin. The Stage 3 Heated Oversized Series of Semi Downdraft is the standard platform spraying and baking Australian made semi downdraft with sizing changes and adaptations to suit larger products. With modular design this unit is available in 4980mm OD widths and unlimited length combinations. 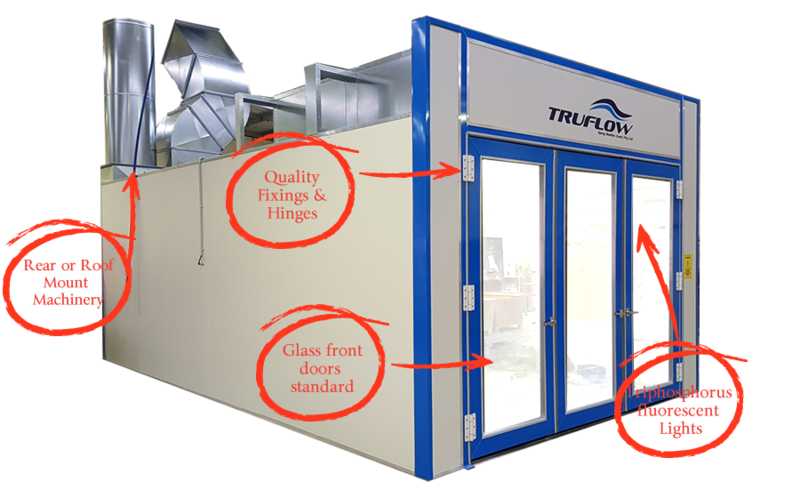 This standard platform custom booth has high production capability and is fitted with the best TRUFLOW equipment and is competitive on price. 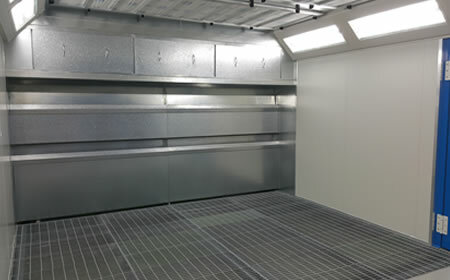 The stage 3 provides a fully compliant Australian manufactured spray booth with spraying and baking capability. Adaptable to various product types and production volumes the large cabin space ensures safety and performance. 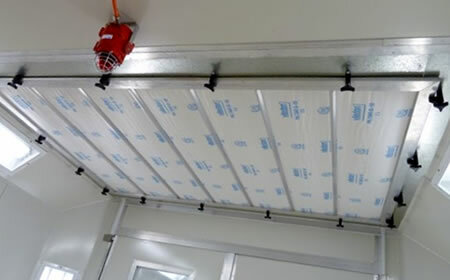 Standard with EPS core 50mm insulated cabin panels the unit is engineered for optimal efficiency in mind. The stage 3 is offered in Water Filter Scrubber exhaust and Dry Filter Exhaust. 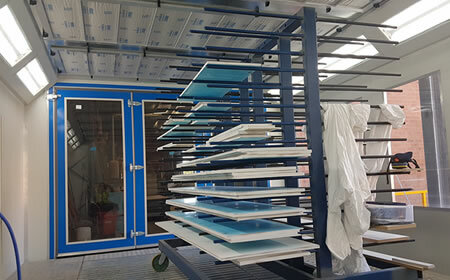 Common Industry Uses: Boating , Marine spray painting, Aviation Spray painting, Automotive repairs ( Custom Cars and Bodyshop repairers), Kitchen Cabinet Making, High Gloss Finishes, Glass Splash back spray painting. 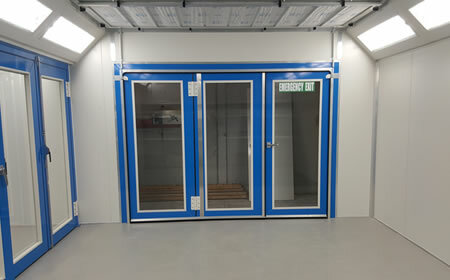 Combine a drying room with a custom sized semi downdraught tailored to suit your workshop. The size of the Stage 3 semi downdraft can be adapted to suit your workshop with the standard width of 4880mm wide and the option to extend the length of your booth to almost any size. No matter what the size of the product you are spraying the Stage 3 Semi Downdraft can be adapted. While the standard unit height on the stage 3 is 2745mm our sales engineers can offer any combination of heights up to 4000mm in this model. 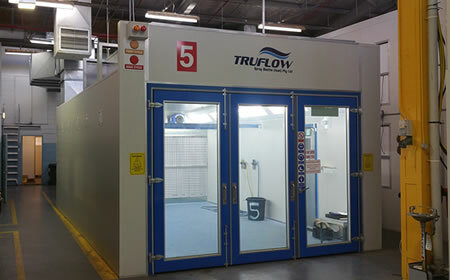 You are never restricted in a TRUFLOW Spray Booth and the stage 3 is no exception. Our sales engineers can adjust the door locations to be front or side including the ability to offer multiple product access points. The stage 3 Semi Downdraft can be fitted with optional side wall lighting to increase the brightness of the spray environment. 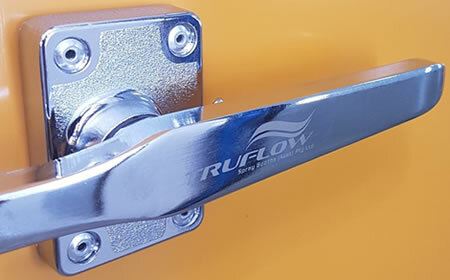 This is particulary useful when additional height is selected and products and or if products such as boats, chassis, resto vehicles or small trucks/trailer are painted. The Stage 4 Water Wall Heated Oversized Series of Semi Downdraft is a high volume production booth. 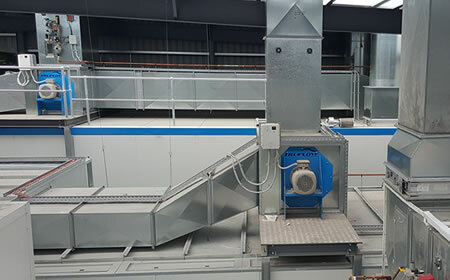 With the use of water filtration this semi downdraft can handle large workloads with no comprimise on quality of finish due to its wet scrubber filtration system and optional water floor base. 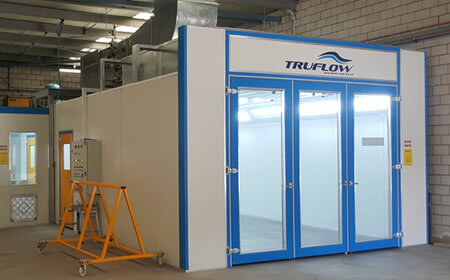 The WWSB spraying and baking booth is like all TRUFLOW products Australian made, it combines modular design with size flexibility and can be adapted to suit your workshop. This spray package is utilised predominantly by Cabinet Makers and kitchen manufacturers where it is renowned for its functionality, quality and return on investment. 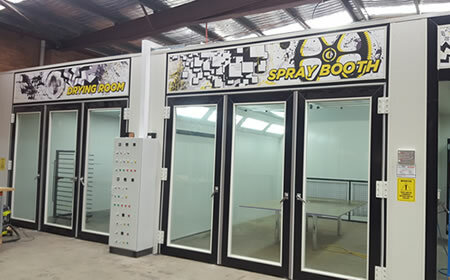 The stage 4 WWSB provides a fully compliant Australian manufactured spray booth with unsurpassed cleanliness and over spray capture in high volume applications. Fully adjustable to various product types the large cabin space, safety and performance will give the operator consistent clean spray jobs 24/7. Common Industry Uses: Kitchen Cabinet Making, High Gloss Finishes, Glass Splashback spray painting, Automotive production lines. 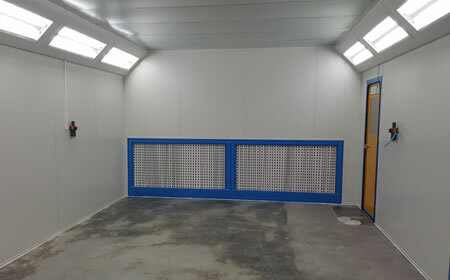 For high volume spray painting there is no cleaner environment than a stage 4 semi downdraught spray booth with water wall and water floor scrubber. Using a venturi water scrubber, this filtration system is a true binks style scrubber brought into the 21st century. No pumps just air pressure. 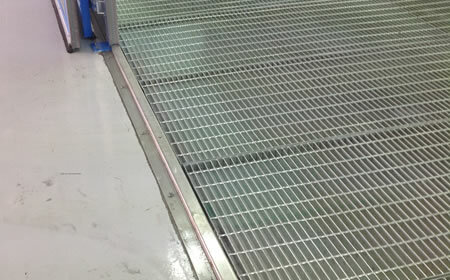 The engineered floor base manufactured by TRUFLOW ensures a strong and durable base while still providing operator comfort. Rated to 2 tonnes the floor base can withstand even the largest of vehicles. 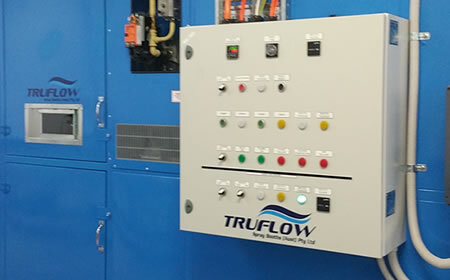 The stage 4 Semi Downdraft has built in pressure adjust ability via the VSD ( Variable Speed Drives) this allows operators to view and set cabin pressure to adjust for filter loading and over-spray build up in the water scrubber. There is simple no better spray booth solution than the stage 4 for the kitchen cabinet makers, shop fitters, glass splashbacks or high end gloss finishes. Unmatchable consistency and quality of spray painting process.